Ozark Trail 20 x 10 Dark Rest Instant Cabin Tent is full of features, a 3-room 12-person freestanding structure with an instant setup and the design that reduces glare. Ozark Trail 20′ x 10′ Dark Rest Instant Cabin Tent. Dark rest technology for reduced glare. The name of this tent is quite descriptive but if you are not familiar with the terminology here are a few words about its features. The numbers 20 x 10 describe its external dimensions; it is almost rectangular so this is close to its floor dimensions. ♦ The tent is cabin style, and this implies tall and quite steep walls, so as usual, this is a very pleasant and livable construction. More about cabin type tents you can see in my separate text. 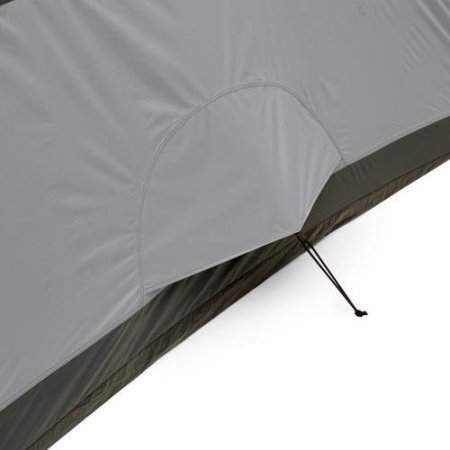 ♦ The tent is also instant type, and this means that the frame is pre-attached to the tent body. So the setup is really instant, you just unfold it, extend its telescopic leg poles and it is ready, all is done in 2 minutes if two people do the job. More about instant tents please see here and a collection of various models you can see here. ♦ But as you realize, there is more in the name – this is a dark rest technology. 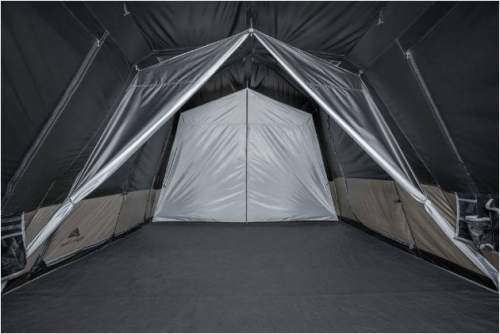 Some manufacturers use the term ‘dark room tent’, while some use ‘lights out tent’. This is a relatively new trend but there are many models on the market; you can see some great examples in my long list. This Ozark Trail 12 person dark rest tent is a part of a series which includes a 6-person dark rest tent and two versions of a 10-person tent, one is described in my separate review and the other you can see in this dark tents list. ♦ This is also a 3-room tent, the separate units are created by two removable dividers which you can see in the pictures. View inside with dividers rolled out. The dividers allow for creating separate units as suits you best. The tent is freestanding but I would not miss to stake it down properly, this is a heavy and big structure and it would not perform well in wind if not secured properly. You have it described elsewhere in detail, here just briefly to stress that you have dark material used in the tent’s construction and in particular in the roof, and you can also regulate the amount of light and reduce glare. This will allow you to sleep longer in the morning or taking a nap during the day, and it also makes a cooler atmosphere in the tent. The declared capacity is 12 people. This is obtained by using the backpacking principle, so it means that you can put this number of sleeping pads on the floor. This can work for groups who only spend nights in the tent, but for real camping, this can never work. Note that you do not have any external storage space for the camping equipment and shoes and boots. So realistically, this is a tent for up to 6 – 7 people. They write that it fits 4 queen size beds, but even if you manage to do this, you will have to walk over the beds. So this is certainly not an option. You can put 3 beds of this type but this is again not the best option. In such a tall structure, you will have space best organized by using some bunk cots. Note that there are such bunk cots also for children. This can save a lot of floor area and you can still store some stuff underneath the beds. The tent is heavy and bulky but all its parameters are quite typical for such a type. So this is a camping tool to use at places with a car access. Seasons-wise, this is a summer camping tent. With such a big structure, so many (pleasant) windows, and the minimal fly, I would not put it in a very harsh environment. It is not designed for such a purpose. However, the construction is such that you can almost completely zip up the huge mesh ceiling area (but there are a few openings that cannot be closed), and this means you can preserve a bit of the warmth inside. So this tent can be used in a cooler climate as well, but if you really need a tent for a cold environment, it is best to check this impressive list. The tent is shown without the fly so you can see its pre-attached frame. Here you have steel in the vertical leg poles and fiberglass on the roof structure. This is all pre-attached in the factory so you have no much work to do with the poles, see the picture above. The tent fabric is 190T coated polyester, they do not provide any information about the waterproof rating, but the seams are taped. Note that the ceiling is a double layer in the biggest part of it, so you have a mesh everywhere and underneath it, you have panels with zippers. So you can close the ceiling almost completely; there are a few areas where you only have the mesh, this is left so on purpose for ventilation. The fly is waterproof as claimed, and you have multiple skylights, this is some PVC material or something similar. It allows the light to pass, so those act as roof windows. But the actual amount of light is regulated by the mentioned inner panels with zippers. All windows, and you have them everywhere around and on the doors, are double layer type as well. So you have a mesh for ventilation, plus zippered panels for privacy and protection. This is all nicely done, nothing to object here. When not in use, the panels can be rolled down and fixed. The floor is bathtub type, most likely polyethylene, quite appropriate and typical for such tents. You have dividers, they are removable and you attach them with toggles. They create 3 separate units for some privacy. You can use only one of course and organize the space as a two-room tent, or not use them at all. There are some 4 storage elements with multiple pockets in each set, see the picture. They are quite reasonable but such big wall area could accommodate much more of such elements, it is never enough. Electric cable port is also there. There is a hook in the central section for a lantern. Not much more to add to the interior, it is simple and square but quite dark when you want it to be so. One of several storage elements on the wall. 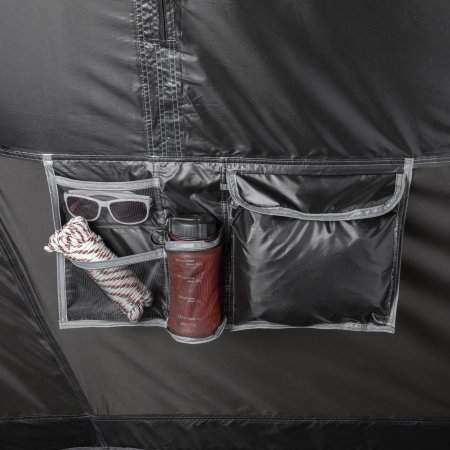 The tent is equipped with two vents, one on each of the two narrow sides, see one in the picture. They are quite small for such a big tent. But you have the ceiling with as much opening as you wish, which you regulate with the ceiling panels, plus the double layer structure on the windows, so this all together should work fine. Very pleasant with its dark rest design. Weight: 54 lb (24.5 kg). Dimensions: 20 x 10 ft (6.1 x 3.05 m). Area: 200 ft² (18.6 m²). Peak height: 80 in (203 cm). Packed size (L x D): 43 x 11 in (109 x 28 cm). 19 steel tent stakes included. It is very useful to compare the parameters of a tent with its competitors built in the same style. In such a way you can better understand its features. So here is this Ozark tent together with the other two with a similar design. The prices of the three tents are respectively $297, 412, 280 (this as of the moment of writing the text, please check the links for updates). So you realize that the price for this tent is reasonable. As you realize, this Ozark Trail 20 x 10 Dark Rest Instant Cabin Tent is quite loaded with features, the dark test technology really sets it apart. The price is good, but it is far too small for the declared capacity. This is typical for many tents on the market, so just divide this number by 2 and this will give you more or less appropriate capacity. Note that I have included this tent in my list of best 12 person camping tents. I already mentioned that this is a part of a series, so if you need smaller tents of this type, check this 6-person and 10-person tents. If you need something different in the same size range please check the Category 11-people plus, you will find some great tents described in detail. 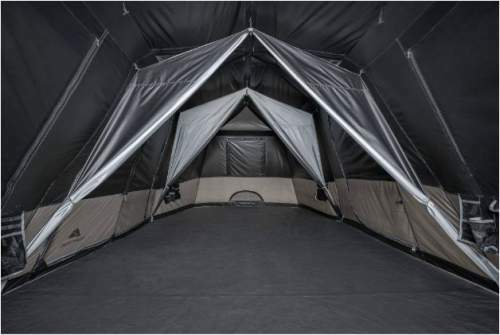 See for example this 11-person tent from the same brand, which is also instant cabin type.